I'm not all about cupcakes. I love lots of desserts! When my husband and I took a road trip up the coast of California earlier this month, we made sure we found the hidden gems to eat at in every town we stopped in. When we got to Cambria, all signs (not literal signs) were pointing to Linn's Easy as Pie Cafe. I can't pass up a good pie. When I walked into Linn's Cafe I was surprised to see it was a sit-down restaurant. I was about to leave when a waitress pointed me to the pie shop outside. Yes, the pies are that popular that they need a separate shop just for them. I wandered out back and was lured in by the smell of fresh pie. 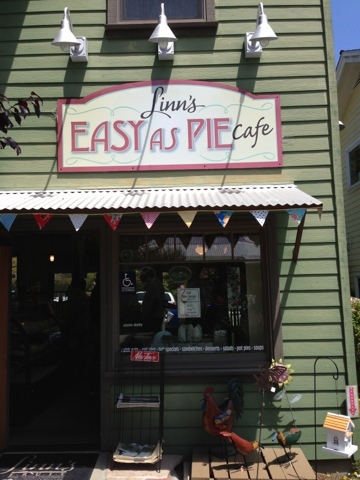 Linn's Easy as Pie Cafe had lots of choices for pie, but only about 5 were available in individual slices. Since it was hard to choose, I had the cashier help me out. It's always a good idea to ask what the most popular item is. I walked out with a slice of apple and a slice of peach-blueberry. 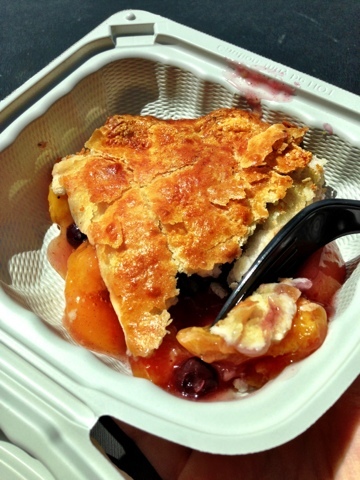 Usually I don't go for the fruit pies, but I let the people make the decision. The crust was so flaky and melt-in-your-mouth. It was easily the best part of the pies. But that doesn't mean the rest of the pies weren't outstanding. I liked the combination of the peach and blueberry together. 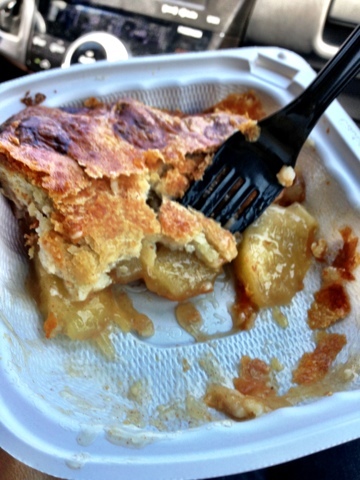 And the apple pie?....as American as it gets. The only thing that would have been better would have been Dutch apple pie (unfortunately, that was only available in whole-pie-form). The other flavor that was a favorite was Olallieberry. I'm saving that one for next time. Linn's also serves other foods such as salads, comfort foods (chicken pot pie! ), soups, and sandwiches. If only I hadn't eaten lunch, I would have ordered a chicken pot pie. Just another excuse to come back another time. Pies go for $15-$18, with slices available for $4.25 each. You can view the menu HERE.